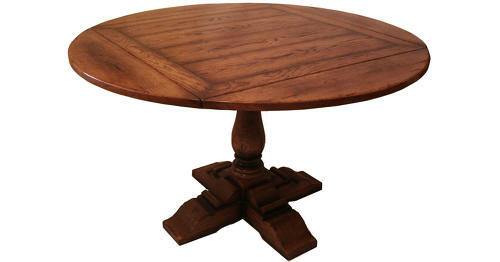 This square to round table has a unique method of extending , the top when closed is square with the leaves tucked up underneath out of sight, when needed they fold down and out and are supported by lopers creating a round top. This particular table is just 36" square when closed, but this method can be achieved resulting in anything up to 5'6" round. This methord of extending could be used on many different designs of base, for example instead of a center column, it could be made with a four-legged base of many different styles. Delivery is normally free within the Surrey area but please inquiry.